Day One of EAT! Week and I’m already in the weeds. Breakfast came off almost to spec: two poached eggs on Grand Central Bakery’s chewy Como bread. Instead of buttering it, I drizzled it with olive oil and rubbed it lightly with a garlic clove. Delicious. Deviation From Plan #1: I didn’t eat my breakfast orange. But my real menu troubles had already started yesterday. I had invited several people over for dinner, but two of them couldn’t make it. I ended up with three defrosted but uncooked chicken breasts. Deviation from Plan #2: In my defense, I got up late!–So the chicken counted for lunch. I froze the panini bread I was supposed to use for my veggie sandwich and promised myself to eat the salad with my soup tonight. So let’s move on to dinner. 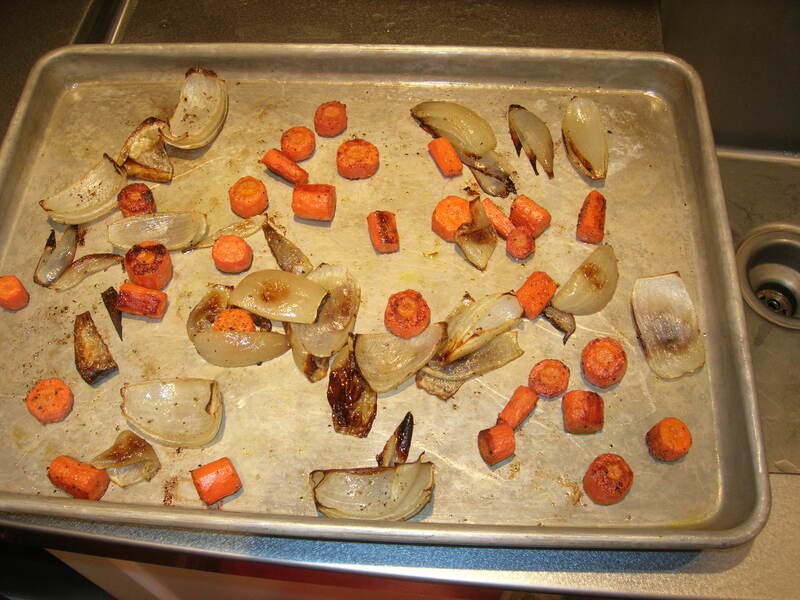 I love the flavor of roasted vegetables in soup, so to get started, I oiled a sheet-pan; cut up a couple of carrots and onions, tossed them with a little olive oil, salt, and pepper, and spread them out nicely; and roasted them at 400 degrees for almost an hour. (But stir them when you hit about the half-way mark.) (If you’ve looked at EAT! week for Sunday, you know I was supposed to roast a red pepper too; but I had some left from dinner last night.) Roast the veg until they get some crusty caramelized patches and edges!–Your soup will thank you for it. Dump a couple of boxes of broth into your soup pot (I used chicken; to make this a vegetarian soup, you can use vegetable). Sometimes I make homemade broth; usually I don’t. But now that I’ve raised the issue of cutting corners, let’s go back into the confessional. Deviation from Plan #3: My half-pound of dried cannellini beans that I was supposed to soak overnight?–Sitting in the pantry, dry as a bone. But! As luck would have it, tucked in not so far from them was a can of the very same beans. I used them. So now we are ready to assemble this soup. First I mince a clove of garlic and add it to the broth with a chopped-up tomato. I let that simmer while the vegetables finish roasting. Then I add the carrots, onions, red peppers, and beans and let the pot simmer for a while. Finally, I add some herbs (this time I went with thyme, summer savory, and oregano) and salt and pepper, and let that all simmer some more. Now the finishing touch–I throw in the spinach just until it wilts (say two minutes). I love this soup! It’s just a hearty, homemade “fridge cleaner” of a soup, but it has a nice sweet/savory flavor from the onions and carrots. I added a green salad with a simple vinaigrette and a slice of toast. (And a glass of wine.) Nice meal! Then I ate my orange that was left over from breakfast. Overall score for Day One: I’d give myself a C+. I ate more meat than I meant to, and basically skipped a meal, but I made a pretty good soup! 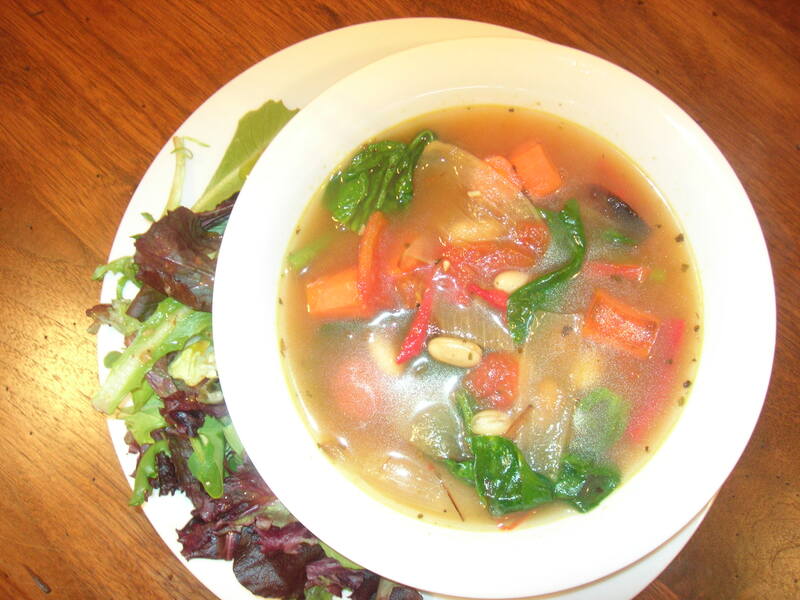 This entry was posted in Meal planning and tagged home cooking, meal planning, vegetable soup by judyramey. Bookmark the permalink.